Taking inspiration from the original concept behind the founding of Saddle Creek, as an attempt to highlight our home city through music and art, we began the Document Series in 2017. Each release featured in the Document Series is comprised of an exclusive record featuring unreleased music from artists outside of the label's roster, along with a specially curated zine created by the artist. Baltimore, MD's Outer Spaces is the name of the electric guitar based indie singer/songwriter project of Cara Beth Satalino. Formerly making music both under her own name and in the short-lived punk power trio Witches, Satalino began recording the first Outer Spaces material herself at her home in Athens, GA. 2013 saw the release of a vinyl 7” on Matador records as part of their Single Going Home Alone subscription series. The following year, they released the Garbage Beach EP on Salinas Records. Outer Spaces full length debut, A Shedding Snake, arrived via Don Giovanni Records in 2016, citing Murmur-era R.E.M. as an influence. 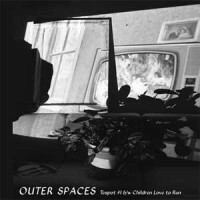 After touring with acts such as Ted Leo, Waxahatchee, Palehound, Radiator Hospital and Clap Your Hands Say Yeah in 2016 and 2017, Outer Spaces has returned with new material for the Teapot #1 b/w Children Love to Run 7” to be released on Saddle Creek May 3rd as part of their Document Series.